Why Is It Important to Manage Horse Manure? The soil can store nutrients, provided the amount of manure applied to the soil is not excessive. When land has excess manure, more nutrients than crops can take up, these nutrients will build up in the soil and pose a hazard to ground or surface water. Excess nutrients can be carried by water through runoff or leaching to surface or ground water. To minimize environmental risk, all horse farms should develop management plans that provide for proper storage, use, and disposal of horse manure. and nutrient balance (shown in the figure below). Farm nutrient inputs consist of feed and fertilizer, but also animals, legume nitrogen, and bedding. Farms may export nutrients through outputs such as grain, animals, milk, meat, eggs, manure, and hay. 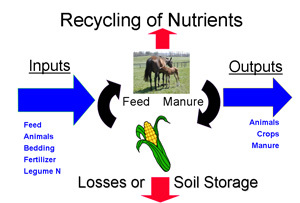 Some nutrients are recycled on the farm, from feed to livestock to soil to plant and back to feed again. The optimal situation is for the farm to remain in balance between inputs and outputs without losses either as runoff to surface water or as leachate to groundwater. For more information, see Whole Farm Nutrient Balance. The challenges of managing manure nutrients are different on a horse farms than on many larger farms. Horse farms often have fewer animals and sometimes several animal species on the same farm, but may have limited acreage for spreading manure. Some horse farms also face a challenge because they do not export nutrients from their system the way that many other farms do–by marketing outputs such as milk or selling animals that are produced. The following articles are available on this website and include links to additional resources for each topic. You may also want to see Nutrient Planning on Small Farms. It provides information about how to feed animals and manage their diets; calculate how much manure is produced. There is also information on basic soil science and soil fertility; and nutrient (manure) management – manure use on and off the farm and nutrient management planning.